In a large frying pan over a medium flame, add in vegetable oil and allow to get hot. Open up can of corned beef hash and put into the hot oil. Break it up using the back of a spatula. Cook the hash for about 15 minutes, turning it occasionally to evenly brown. Heat up corn tortillas by placing them on an open flame. Spoon in corned beef hash into the center of each tortilla. Sour cream and salsa go well as condiments for these tacos! When I was about 4 years old, I was sitting at our family table patiently waiting for my grandpa to serve dinner. I suddenly heard him muttering to my Auntie Rosie about how he was making corned beef that evening. She then asked him something that I found very strange: "Dad, is that corned beef from a can?" From a can?! I had never heard of meat in a can! I have to admit I was a little scared, partially because my grandfather wasn't a conventional cook. As it turned out, the corned beef from a can wasn't so bad. In fact it was awesome! It even became a regular thing for our family. 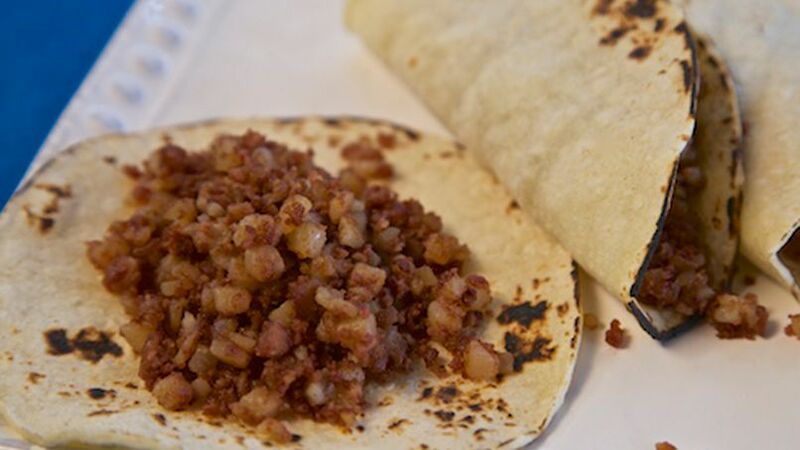 Check out my recipe of corned beef hash tacos... it will blow your palate away!